William Shakespeare (1564-1616) is one of the most famous and influential English writers. He wrote dozens of plays and poems. But he also introduced thousands of words and phrases into the English language which are still popular today. 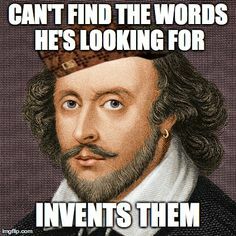 However, today many people believe that Shakespeare may not have invented some of these words and phrases, but rather his works are the first time the words were actually written down. This does not discount the fact, however, that Shakespeare was a master of English and a huge influence on the language lasting until today. Below are many phrases from Shakespeare. Below that list are many words we got from Shakespeare. Have a question about any of them? Just ask us!! “It’s Greek to me” (Julius Caesar) – When you say, “it’s Greek to me” you are admitting that you do not know or understand something. “Fair play” (The Tempest) – Follow the rules, especially in competitions or sports. “All that glitters isn’t gold” (Merchant of Venice) – We usually use this phrase after we discover the fact that something that looks good turns out not to be that great. “Wear one’s heart on one’s sleeve” (Othello) – To be a hopeless romantic (or be open and honest about how you feel) is to wear one’s heart on one’s sleeve. “Break the ice” (The Taming of the Shrew) – Often when you meet someone for the first time, you “break the ice” by asking them polite questions about themselves. “The lady doth protest too much” (Hamlet) – If someone denies something more than once, you can say “the lady doth protest too much,” meaning you think that they feel the opposite to what they are saying. “Clothes make the man” (Hamlet) – Although not always true, this phrase implies that how a person dresses tells you something about who they are as a person. “A laughing stock” (The Merry Wives of Windsor) – To be a laughing stock is to be considered a joke by many people. “Too much of a good thing” (As You Like It) – It is said that “too much of a good thing” (i.e. money, love, food) is not necessarily good for you. “In a pickle” (The Tempest) – To be “in a pickle” is to be in trouble or a situation that you cannot easily get out of. Auspicious – favorable; promising success; a good omen. A wedding is an example of an auspicious occasion. Baseless – without a foundation; not based on fact. If you accuse someone of wrongdoing, make sure that you have support to back up your claim and it is not a baseless accusation. Barefaced – shameless; without concealment or disguise. When someone tells a ‘barefaced lie’ it is not a very good one and you immediately know it is not true. Castigate – to punish harshly. Sometimes celebrities and politicians are castigated in the press more harshly than ordinary citizens. Clangor – a loud (clanging) sound. Ghosts are sometimes said to be followed by the loud clangor of chains. Dexterously – skillful, especially in the use of one’s hands (or also one’s mind). A good carpenter can dexterously build a bookshelf very easily. Dwindle – to get smaller; diminish. Often used to describe money. Many people’s savings dwindle after losing a job. Multitudinous – a lot; a great number. You are in luck if you can say that you have a multitudinous amount of friends. Sanctimonious – pretending to be very religious or righteous. Sometimes people who judge others harshly are sanctimonious. Watchdog – a person or group that keeps close watch to discover wrong or illegal activity. A popular watchdog group is PETA, which exposes wrongful actions against animals. This entry was posted in English Blog, Uncategorized and tagged academic writing, accredited esl school, accredited school, American Culture, atlanta english, CCB, english academy atlanta, english academy duluth, English class, english classes, english conversation, english duluth, english expressions, english institute atlanta, english institute duluth, english language, english literature, history of english language, shakespeare. Bookmark the permalink.